In collaboration with one of the UK's most experienced utility management companies SV Surveying Ltd is able provide a range of leading edge, non intrusive investigation services to the utility and engineering sectors. This service along with our experience in GPS and Topographic surveys provides clients with a comprehensive solution to any of the problems listed below. As well as such core activities as utility detection, we provide a diverse range of geophysical solutions to engineering problems using techniques such as Ground Penetrating Radar, Infra-red, Linear Polarisation and EM to name a few. 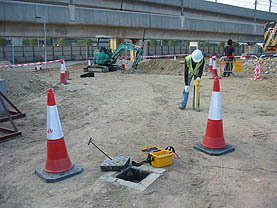 We can provide expert utility detection and mapping services without the need for any intrusive excavations. This service can be tailored to your own particular project requirements where you want to manage the risks, cost and your reputation. Rather than relying on inaccurate utility records to design your project, we can pinpoint the actual position and depth of all utility services thereby giving you more confidence on site. Traced utility services are mapped by our topographical surveyors and the information is then presented as either a hard copy or as a Cad file. Our Virtual Trial Hole utility detection service provides a real alternative to traditional labour based excavation methods. We can significantly reduce environmental and safety disruption, and additionally NRSWA administration concerns. If you require the targeting and avoidance of utility services in small areas, then our service is the quickest and cheapest answer. Utilising a range of non-destructive techniques to evaluate concrete and masonry structures. These investigations are often needed to confirm drawing details prior to modifications to ensure safe loads are not exceeded. Using Ground Radar techniques, we can identify the layered thickness of reinstatement materials. Additionally the voiding of reinstatement and other sub surface anomalies can be identified and recorded. We provide services to identify issues such as washouts or settlement gaps beneath roadways or floor slabs, un-grouted masonry cells, bubbles in concrete pours etc. We are able to detect and delineate these issues using non-intrusive geophysical techniques. We are able to identify the causes of embankment slippage, the thickness of the retaining wall, leakage through the concrete and the presence of voids behind or within the wall itself or within the embankment, such as those formed by animal burrows. Brown field sites are being increasingly redeveloped after decades of industrial use. We provide a suite of non-invasive geophysical techniques which can provide quick and accurate mapping information on man-made hazards, redundant utility services, sinkholes or contamination.